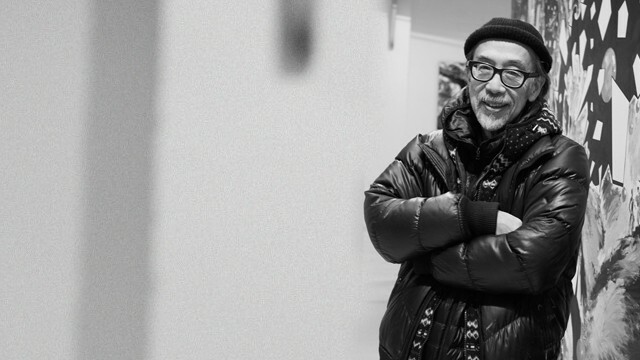 Born in Kyoto in 1944, as a child, Aki Kuroda devoured the magazine “The Minotaur”, initiating his artistic evolution. He leaves Kyoto and travels through Europe and the United States. Noticed in the 80s for his silhouettes and monochrome paintings, his work has inspired the greatest names of literature such as Marguerite Duras, Michel Foucault or Pascal Quignard. In parallel to painting, he conceived the set decor of the ballet “Parade” for Angelin Preljocaj in 1993 at the” Opera de Paris”and the “Festival d’ Avignon” for which he also created the posters in 1993 and 2000. He is a man of “passages”: between cultures, between the East and the West, between the uncluttered peace of the Zen universe and the itch of Graffiti. He navigates between soul and body, between the archaic myths and the future to invent, his diverse skills and creations in drawing, painting, engraving, sculpture, fresco, photography, set- decoration, installation and scenography. Since the 90s, he has been the creator of a singular project, “Cosmogarden”, which comprises not only fantastic murals but a series of performances which he develops with dancers and architects. Kuroda also is a thinker and a reformer of the city: As the western so called “functionalist” city has admitted defeat Kuroda states «the artist must therefore re-create in the City a different cosmos, something twisted, an uncultivated expanse, so that people can find the human dimension again”.